Home > Blog > Watch Out For the Wolf! Tom Bonney and his friend, John Barefoot, who both work in land development at Kimley-Horn, got to attend the NC State vs. UNC game on November 25 as part of the “NC State Game Day Experience with Terrence & Torry Holt.” Tom purchased a raffle ticket and came out the lucky winner at the Holt Brothers Foundation Playoff Party in January. And John was his lucky friend! They spent the afternoon and evening with Terrence and Torry, seeing NC State football “behind-the-scenes” – the weight rooms, physical therapy stations, dining facilities, and players’ locker rooms. 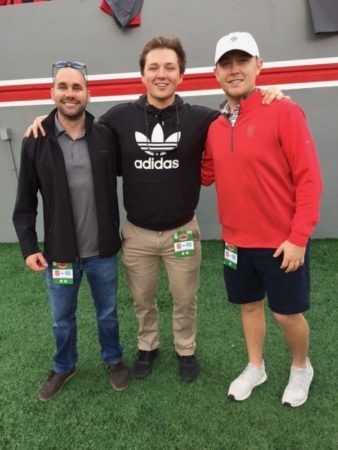 Highlights from the day included (1) walking out of the player’s tunnel before the game, (2) meeting singer Scotty McCreary, and (3) witnessing an NC State victory against rival UNC as on-field spectators. After all the players and coaches ran out on to the field, Tom and John followed them through the players tunnel. “The smell of smoke and the sudden booms from the fireworks made the experience so much more real,” Tom said. “Torry also made sure we knew NOT to run into the wolf on our way out, as it is hard to see with all that smoke! The feeling once we walked onto the field was incredible — difficult to describe. You go from the narrow tunnel view to a huge, wide stadium with thousands of people cheering and fireworks going off. It was phenomenal!” Tom said that he felt so energized after coming out of the tunnel that he was ready to play! Tom and John also stood next to Scotty McCreery on the sidelines, something they didn’t expect (see photo for proof). The guys both described the experience as more emotional than being in the stands. “We’d be watching the game and then, all of a sudden, an out-of-bounds play would happen,” said Tom, causing them to pay attention, move to the side or back up. They both said that seeing the interceptions and fumbles from the sideline made the second half of the game incredible to watch. 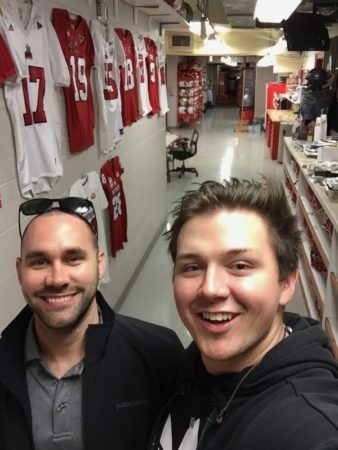 As Tom and John will testify, the NC State Game Day is an experience they’ll never forget. There’s nothing like seeing football from the sidelines and spending the day with two former NC State greats — Torry and Terrence. And “Watch out for the Wolf” (really Tuffy the Dog, but who cares?) now has a whole new meaning for them.